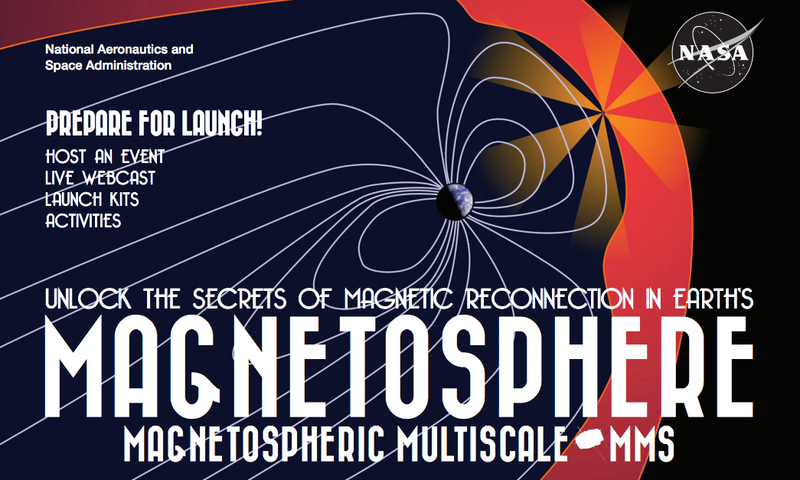 This evening at 10:44 PM EST, NASA will launch the Magnetospheric Multiscale (MMS) mission, from Cape Canaveral, Florida. This is a group of four satellites which will fly in tetrahedron formation, measuring the magnetic field around the Earth and looking for occasional "magnetic explosions" called magnetic reconnections. I'll be attending the launch and reporting back next Tuesday with images and video. For now, keep reading to find out more about the key science this quad satellites hopes to complete while in orbit and tune in to NASA TV tonight to watch the launch live. When I was a graduate student, the astrophysicists around me were always blaming turbulence and magnetic fields if they didn't understand a particular observation or simulation. Both phenomena are everywhere in the Universe, yet their complexity makes them poorly understood — easy scapegoats when simple physics estimates don't match observations. MMS hopes to change this by increasing our knowledge of magnetic fields, and how they change over time. Structure of the Earth's magnetosphere. The distance from the Earth to the "bow shock" of the magnetosphere (the part facing the sun) is about 40,000 miles. Credit: Public domain. Like high-energy particle physics, magnetic field evolution is tricky to study in the lab, but tens of thousands of miles up, the Earth's large-scale magnetic field, known as the magnetosphere, constantly interacts and evolves with the solar wind plasma streaming from the Sun. The magnetosphere shields Earth from the majority of the high-energy solar particles, but large outbursts from the Sun can penetrate the magnetosphere and damage electronics in navigation and communication satellites and even affect the power grid on Earth. reconnecting in a different orientation. 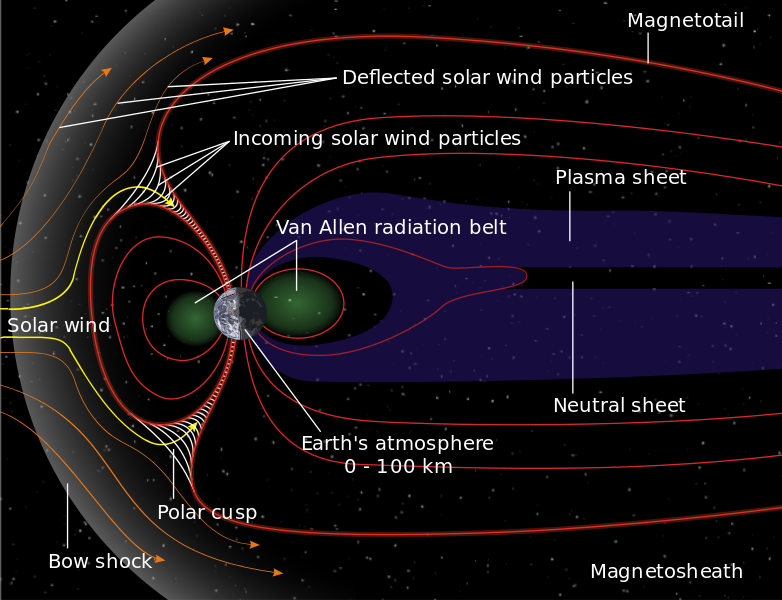 MMS will position itself right at the point of interaction between the magnetosphere and the solar wind and collect data that will help scientists better model and predict the consequences of solar flares. "The universe is full of plasma, and it's full of magnetic fields and all over the place in the Universe you have one plasma colliding with another. An example of that is the solar wind coming in and colliding with Earth's magnetosphere," said NASA scientist John Dorelli in a recent video. "... you can think of it as kind of like a magnetic explosion". This magnetic explosion is known as magnetic reconnection and is thought to occur when two magnetic fields meet, break apart, and reconnect explosively. During reconnection, some of the magnetic energy is converted into kinetic and thermal energy, accelerating particles to nearly the speed of light in the process. Reconnection is believed to drive much of the dynamic properties of the surface of the sun, including solar flares. But the details are still poorly understood. MMS is actually four identical spacecraft each equipped with sensors to measure the magnetic and electric fields in all three directions. 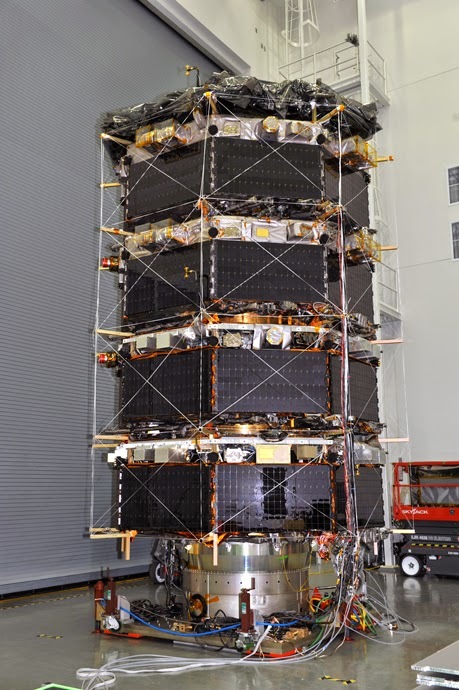 During launch these spacecraft will be stacked like oreos on top of each other, but once in orbit they will perform a crucial separation maneuver to form a pyramid-like formation. This will allow MMS to measure magnetic reconnection events in three dimensions, with far better precision than ever before. The size of the formation will range from about 6 to 60 miles across. This is tiny compared to the scale of Earth's magnetosphere, which extends millions of miles on the nightside of the Earth. Nevertheless, scientists hope MMS will fly through at least one magnetic explosion during its 2.5 year mission and have carefully designed the orbit to increase this chance. The highest levels of reconnection occur right at the boundary where the solar wind collides with the Earth's magnetosphere and MMS will intercept this boundary many times, flying nearly 50,000 miles (about one-fifth of the way to the Moon) from Earth during the first few years. By better understanding magnetic reconnection, scientists will be able to improve their simulations of space weather around the Earth and predict when a reconnection event is going to happen. This would allow engineers to protect satellites before damaging solar weather occurs. Beyond Earth, magnetic fields drive dynamics everywhere in the Universe, from black holes to newborn stars, and current simulations simply do not have enough data to model them accurately. "The people who do those simulations and try to apply them to all other kinds of places, like in the solar atmosphere, at other astrophysical stars and objects, they're very interested in whether those simulations are accurate and reflect reality well. This is going to be the first time we actually bump them up against hard data", said Tom Moore, senior project scientist for MMS in a NASA Mission Overview video. Stay tuned for images and video of tonight's launch on Physics Buzz next Tuesday, and follow the live launch coverage starting at 8 PM EST (launch scheduled for 10:44 PM EST) on NASA TV. How Do Mussels Stick to Wet Rocks? The Unnatural Properties of a Designer "Sponge"